The federal government requires that Delaware County replace its emergency communication system, having sold the frequencies on which it operates. The existing system was built in the 1970s and replacement parts are no longer manufactured. Also, it reaches mobile units in only 65% of the county, whereas the new system should reach 95%. Costs are estimated at $5 to 10 million, of which $5.3 million has been covered by grants to date. The required new communication towers are to be located near the existing ones, of which there are twelve. Phase I includes replacement of the four towers in primary locations such as on top of Franklin’s Johnson Mountain, just south of Heathen Hill. Other primary locations are Houck Mtn., Walton; Mt. Pisgah, Andes; and Mt. Utsayantha, Stamford. The existing facility must be kept operational until the new system is completed, and the new tower also requires an equipment shack. On Johnson Mtn., the county had planned to put the new tower and its shack next to the old one, but the land owner, Mr. Leva, complained that it would take up more of his limited road frontage. He suggested a property across Ed Klug Road, owned by his mother. According to Supervisor Taggart, an agreement was reached with the Leva family to locate the new tower on a half acre of Maria Leva’s parcel, across from the existing tower. But since late last year, he said, the owners have been involved in a family squabble, and have not responded to numerous attempts to finalize the easement. 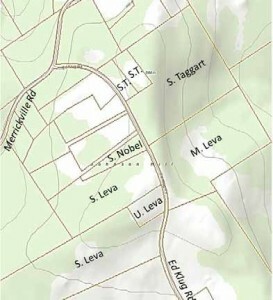 It is unclear why only a Leva family property is suitable. While they own four parcels that are above 2,000’ along Ed Kung Road, Scott Taggart owns others nearby. The Leva family are nonresidents, whereas Mr. Taggart lives in Franklin. With construction now on hold, the Delaware County Board of Supervisors voted unanimously at their April 9th meeting to begin eminent domain proceedings (Resolution 78). But apparently there were problems with the wording. So, in their meeting of May 25th, they rescinded that resolution and voted for the similar Resolution 114. Seven of the twelve towers are planned for completion this year, and completion of the system is scheduled for mid-2016.